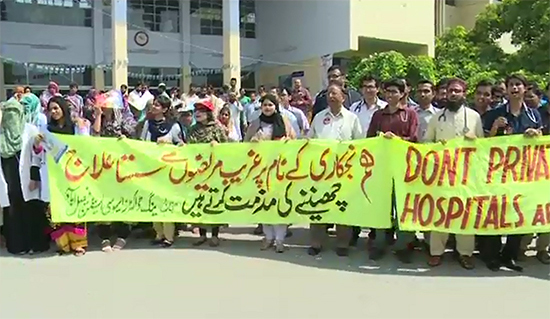 LAHORE (92 News) – The Young Doctors Association (YDA) has once against took to the streets on Thursday to protest in favour of their demands. The doctors held a protest demonstration and sit-in against the privatisation of government hospitals and demanded a pay raise at Mall Road, Jail Road, Canal and Ferozpur Road. The doctors while boycotting the outdoor, blocked the road for traffic, chanted slogans against the Punjab Government. The doctors were of the view that the government has failed to run health department by outsourcing in at least 10 districts, adding that the poor would face problems. On the other hand, patients faced severe problems due to the shutdown of outdoor and waited for long hours for the protest to end.